In this examination of the Roman institution of slavery, Brent Shaw presents a compelling selection of the ancient testimony relating to Spartacus and the Slave Wars. A revised introduction places Spartacus in the context both of recent historical work and in relation to images of Spartacus in television and film media. The existing collection of translated Greek and Latin sources has also been fully revised, and now includes additional documents that flesh out the Roman responses to the Spartacus slave revolt. A new image has also been provided to illustrate the nature of the slave villas of the period. Along with the existing Glossary, annotated list of ancient writers, and maps, the new edition also features a fully revised and updated Bibliography, Chronology, and set of Questions for Consideration. "Here Shaw provides a virtually comprehensive collection of translated sources for Rome's major slave wars, superbly contextualized for the undergraduate student. 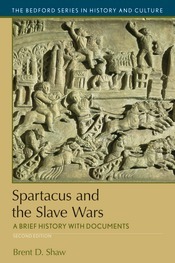 As a bonus, the reader gets an eye-opening essay on Spartacus as a modern historical icon, the best short introduction to the nature of Roman rural slavery that one is likely to find, and a thoughtfully selected bibliography. Even specialists in ancient slavery will have much to learn from Shaw's incisive analysis."